Young riders galloped across Utah's west desert, over one of the most difficult and dangerous legs of the legendary Pony Express route, delivering mail from Missouri to California before the advent of the telegraph. 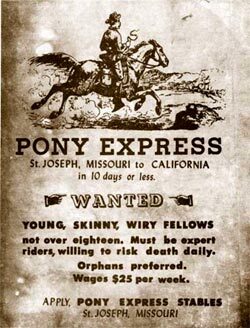 The Pony Express operated for only 18 months, and was plagued by problems, but proved to be an important means of communication during a critical time just before the Civil War. The tough riders earned a place in history and folklore. To carry the mail across 1800 miles of wilderness, Pony Express riders changed horses about every 12-15 miles. Stations were built at those intervals along the route. The famed Overland Stage used much of the same route and many of the same stations. Today the route has been declared a National Historic Trail. An improved dirt road follows the route across Utah's west desert. Historic plaques have been placed to mark the location of several stations, and some of the old buildings have been restored. It is fun to drive the route, or to ride parts of it on mountain bikes or horses. The west desert section of the trail stretches from Faust on the east (located just east of Hwy 36, west of Provo) to Callao and then Ibapah on the west, before crossing into Nevada. During dry weather the route can be driven in a family automobile. In wet weather it may be impassible even to 4X4 vehicles. It is about 120 miles from Faust to Ibapah. That is a long drive on dirt roads. The area is virtually uninhabited. There are no services, no gas stations or fast food establishments, along the way. Water is available in only a few spots. It is a great drive. Just be sure to bring a detailed map, have a full tank of gas and carry emergency supplies. See Pony Express National Historic Trail, Historic Resource Study for additional information. © Juab Travel Council. All rights reserved.